The Chinese festival of clear brightness, or Qingming, falls on April 5 this year. It is a day when the Chinese visit the burying places of their lost loved ones and honor their memories. It is also a festival that celebrates life as nature thrives with renewed vitality in the spring season. 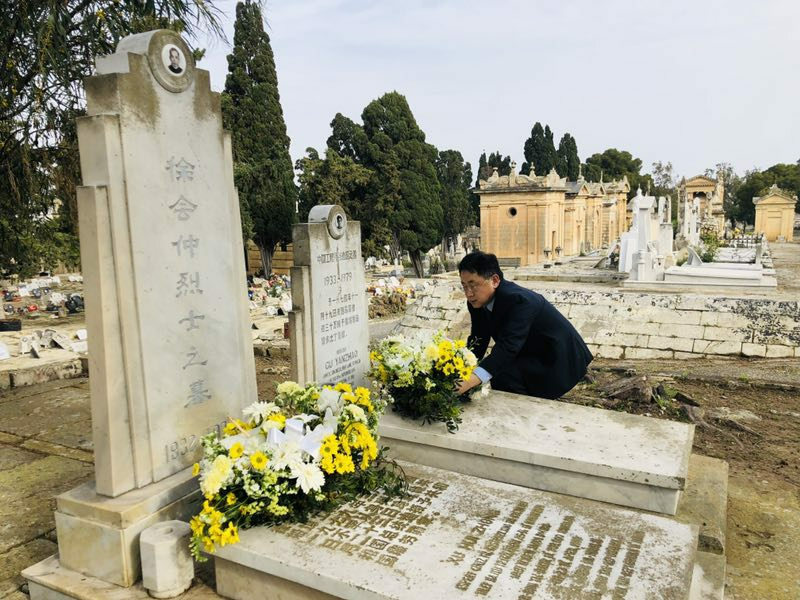 Once againI came to the Addolorata Cemetery on this day to pay my tribute to Mr. Xu Huizhong and Mr. Gu Yanzhao, the two Chinese engineers laid to rest here. Away from the hustle of the world outside, the cemetery was poignantly quiet, and their tombstones dappled with rays of sunshine. As I stood before the tombstones, thoughts started to drift back, all the way to the 1970s. I thought of the day in 1972 when China and Malta established diplomatic relations thanks to the strategic vision of the leaders of the older generation, the day when a new page was turned in the history of our exchanges. I thought of how China, though still quite poor itself in those days, helped Malta build the 300,000-ton dry dock. Construction of this project started in 1975 when more than 800 Chinese experts and engineers traveled thousands of miles to Malta and worked side by side with the local Maltese day and night, facing down many challenges and obstacles. In 1980, they completed the then biggest dry dock in the Mediterranean. Hailed as an engineering feat and standing as a monument of China-Malta friendship, Dock Six is still playing an important role in Malta's economic development today. During its construction, two Chinese engineers lost their lives. In 1979, Mr. Xu Huizhong was hit by a falling crane nut in an on-site inspection, and died on duty. In the same year, Deputy Chief Commander of the project, Mr. Gu Yanzhao died of liver cancer under constant overwork. In the Chinese tradition, one shall be laid to rest in his homeland. However, the families of the two engineers decided to have their loved ones buried here in Malta, the country where they had worked and lived for so long. 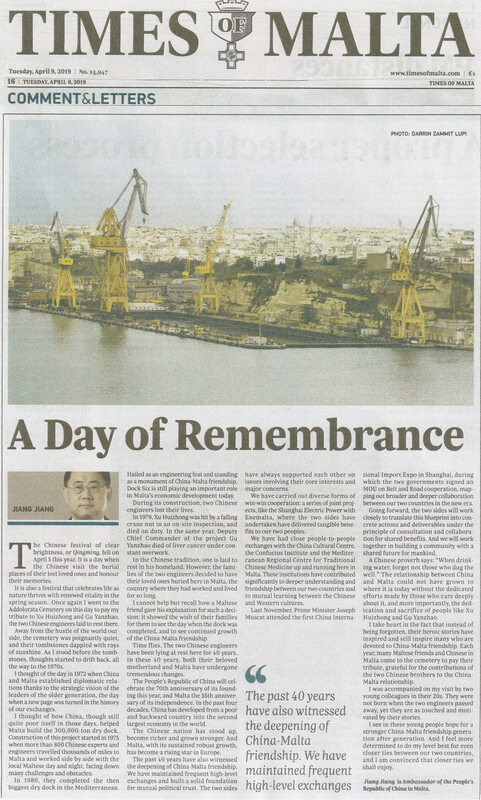 I cannot help but recall how a Maltese friend made his explanation for such a decision: it showed the wish of their families for them to see the day when the dock was completed, and to see continued growth of the China-Malta friendship. Time flies. The two Chinese engineers have been in rest here for 40 years. In these 40 years, both their beloved motherland and Malta have undergone tremendous changes. The People's Republic of China will celebrate the 70th anniversary of its founding this year, and Malta the 55th anniversary of its independence. In the past four decades, China has developed from a poor and backward country into the second largest economy in the world. The Chinese nation has stood up, become richer and grown stronger. And Malta, with its sustained robust growth, has become a rising star in Europe. The past 40 years have also witnessed the deepening of China-Malta friendship. We have mantained frequent hight level exhanges and built a solid foundation for mutual political trust. The two sides have always supported each other on issus involving their core interests and major concerns. We have carried out diverse forms of win-win cooperation. A series of joint projects, e.g. the Shanghai Electric Power with Enemalta, that the two sides have undertaken have delivered tangible benefits to our two peoples. We have had close people-to-people exchanges with the China Cultural Center, the Confucius Institute and the Mediterranean Regional Center for Traditional Chinese Medicine up and running here in Malta. These institutions have contributed significantly to deeper understanding and friendship between our two countries and to mutual learning between the Chinese and Western cultures. Last November, the Hon. Prime Minister Muscat attended the first China International Import Expo in Shanghai, during which the two governments signed an MOU on Belt and Road cooperation, mapping out broader and deeper collaboration between our two countries in the new era. Going forward, the two sides will work closely to translate this blueprint into concrete actions and deliverables under the principle of consultation and collaboration for shared benefits. And we will work together in building a community with a shared future for mankind. A Chinese proverb says, "When drinking water, forget not those who dug the well." The relationship between China and Malta could not have grown to where it is today without the dedicated efforts made by those who care deeply about it, and more importantly, the dedication and sacrifice of people like Xu Huizhong and Gu Yanzhao. I take heart in the fact that instead of being forgotten, their heroic stories have inspired and still inspire many who are devoted to China-Malta friendship. Each year, many Maltese friends and Chinese in Malta come to the cemetery to pay their tribute, grateful for contributions of the two Chinese brothers to the China-Malta relationship. I was accompanied on my visit today by two young colleagues in their 20s. They were not born when the two engineers passed away, yet they are as touched and motivated by their stories. I see in these young people hope for a stronger China-Malta friendship generation after generation. And I feel more determined to do my level best for even closer ties between our two countries, and I am convinced that closer ties we shall enjoy.